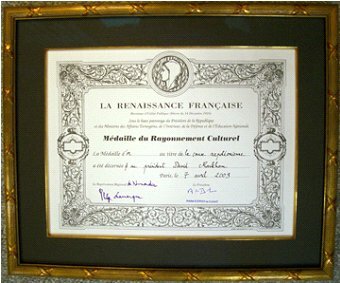 INS President J. David Markham and Instituto Napoleónico México – Francia founder and President Eduardo Garzón-Sobrado have been awarded medals for their work by La Renaissance Française, an international French cultural organization with the high patronage of the French President and the ministries of Foreign Affairs, Interior, Defense and National Education. Formed by decree in 1924, the Renaissance Française promotes French culture and language through a variety of activities, including the awarding of bronze, silver and gold medals in several categories. President Garzón-Sobrado was given the gold Médaille du Mérite Francophone for his creation of the Instituto Napoleónico México – Francia, through which he has promoted both Napoleonic history and the French language. Using his own initiative, President Garzón-Sobrado has established the Count Las Cases Memorial Prize for Napoleonic Literature that recognizes both articles and books that are important contributions to Napoleonic History. He has cooperated with the International Napoleonic Society and organizations in France to a French presence to Mexico that until now had never existed. INS President J. David Markham received the gold Médaille du Rayonnement Culturel for his many years of promoting French culture and history in the US and throughout the world. An award-winning author of numerous books and articles on Napoleon and the French Revolution, Markham also co-hosts the Napoleon 101 podcast, has been on numerous documentary TV shows, has been active in French organizations in several states, and has served as Executive Vice-President and now President of the International Napoleonic Society. In that capacity he has organized Napoleonic history congresses throughout the world. The INS offers our congratulations to presidents Garzón-Sobrado and Markham, as well as to La Renaissance Française for its outstanding work in promoting French culture.